Christmas Eve around the tree with four excited grandchildren produces memories that last a lifetime. 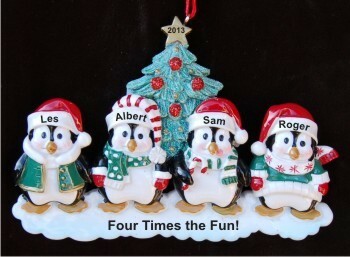 Keep those fun moments always fresh with the 4 styling penguins, our fabulous grandkids personalized Christmas ornament from Russell Rhodes. Each of these grandparents ornaments is hand painted with richly hued, merry colors fit for the season. The styling penguins fabulous grandkids Christmas ornament personalized for special grandparents or grandchildren will be a delight when it arrives in our beautiful velvet gift bag with a display cord attached.